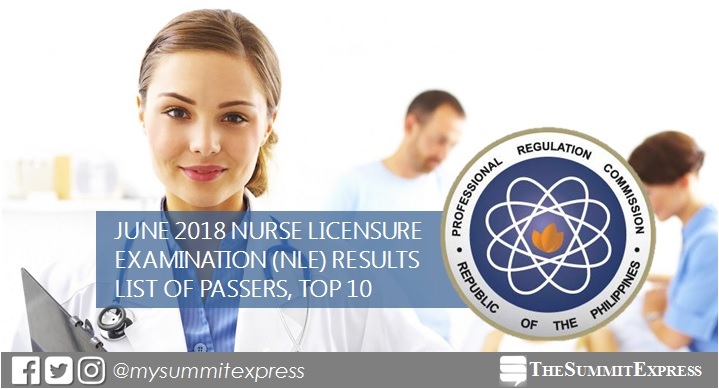 MANILA, Philippines – (Updated June 20) The June 2018 nurse licensure examination (NLE) results or nursing board exam list of passers, top 10 (topnotchers), top performing schools and performance of schools are available here as officially released by the Professional Regulation Commission (PRC) and Board of Nursing (BoN) on Tuesday, June 19 or in nine (9) working days after the last day of exam. The June 2018 NLE was conducted in various testing centers nationwide: Manila, Baguio, Cagayan De Oro, Cebu, Davao, Iloilo, Legazpi, Lucena, Pagadian, Tacloban, Tuguegarao and Zamboanga. According to PRC Resolution No. 2017-1068, the target date of release of NLE results is on Friday, June 22, 2018. The 'big day' falls in 18 calendar days or in just 12 working days after the last day of exam. The computed number of working days excludes 2 Saturdays and Sundays and 2 public holidays (Independence Day on June 12 and Eid'l Fitr on June 15). In the same period last year, results were released in just 8 working days after the last day of exam. PRC named 3,882 out of 11,176 (34.74%) who passed the exam. In June 2016, results were released in 9 working days ahead of the target schedule. A total of 6,183 out of 14,184 (43.59%) passed the exam. In May 2015 exam, PRC announced results in 16 days after the exam. A total of 9,707 out of 17,891 (54.26%) successfully hurdled the exam. We advise takers to monitor results starting Monday, June 18 until the 22rd or within 8-12 working days. The Summit Express has partnered with PRC Board News to deliver updates before the official release of NLE results. We will update this page once we got reliable information from our sources. In the previous board exams, takers can expect exact release date of results by always visiting this site. It's also possible that PRC will release results on earlier date than our expected timeline if there's further improvement in the PRC system of checking of results. June 19, 2018 Second Update: NLE results are out!